Guam’s greatest heavyweight added to his collection of international MMA wins with a first round TKO in Japan’s Rizin 12 fight card Sunday night in Nagoya, Japan. Roque Martinez withstood a stand up war with Japan’s Kiyoshi Kuwabara (aka Japanese Mark Hunt) before the referee saw enough damage on the hometown opponent. Roque Martinez celebrates after a first round TKO over the Japanese Mark Hunt in Rizin 12 in Japan on Sunday. Both fighters came out slugging at one another, but it was Kuwabara who sustained the most obvious damage as Martinez got the better of the two, bloodying his foe before the referee stoppage. “I can stand and trade all day,” Martinez told GSPN after improving to 13-4-2 in his career. 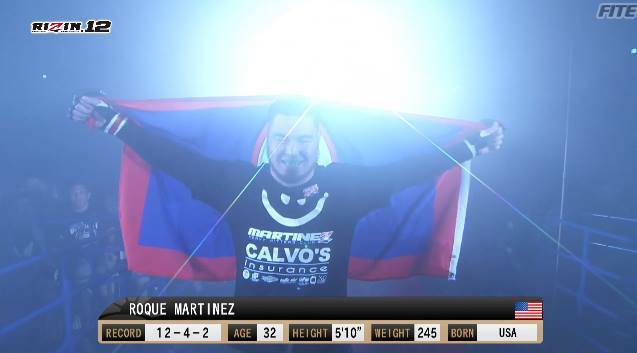 Martinez tipped the scale at 244 lbs. on Saturday and looked in his best shape of his fighting career. The conditioning was obvious as he showed no signs of fatigue throughout the lone round.